A while back, I heard about Veg-O-Rama. Then I noticed its presence on Central, a restaurant all dolled up inside, but devoid of customers. I'm not sure of the actual time line, but it seemed like it sat empy for a while, and rumors spread about its possible death before birth. I wasn't feeling very hungry, so I ordered a Greek Salad and cup of French Onion Soup, and my dining companion ordered the Tofu Reuben. I've tried to like tofu in the past and never thought it was going to happen for me, until I tried Veg-O-Rama's Tofu Reuben. It was delicious. This may have been due to the fact that it was smothered in melted cheese and a tomato tahini sauce, but that's beside the point. I also tried my friend's side of potato salad which was really good as well. My salad, on the other hand, was confusing- a Greek salad with all the usual ingredients, but with a lemon vinaigrette. My French Onion Soup was sweet, which was not bad, but as I mentioned during our Lindsay Beeson Bacon Cookie post, I don't like when salty things try to be sweet and vice versa. I just wanted my soup to be cheesy, hot, and salty, and it was not. Even though my food wasn't as enjoyable as I had hoped it would be, I am a maturing optimist and realize Veg-O-Rama's potential. Supposedly the menu will keep a few staples but change items every now and then to provide even more vegetarian options for Knoxville. In the categories of ambiance, service, and location, I thought Veg-O-Rama was wonderful. It even has a little bar in the back corner, from which they sell organic (and non-organic) wine and beer. 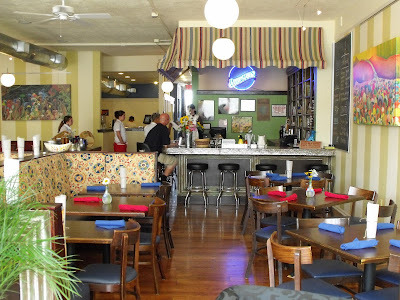 The set-up of the restaurant reminded me of cafés in Cape Town and Stellenbosch, South Africa where I spent some time "studying" a few years back. This is a grand compliment as they were some of the most enjoyable places I've ever eaten. 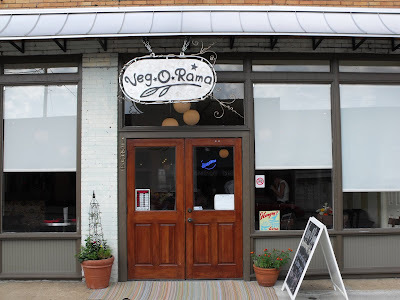 So, vegetarian or not, please go get your veggie on at Veg-O-Rama. If you haven't been to that part of Central in a while, it's very up-and-coming and could be the location of great things for Knoxville's art and food scene. Let's keep our fingers crossed. This is the one next to 8 Shooters gallery, n'est pas? I sure miss that section of N. Central. Time Warp Tea Room was always my favorite spot for studying (napping). "Friends" is an amazing antique store. And who can forget Mr. Freezo? And now a vegetarian restaurant! Just one more reason why Nashville is no good and I should move back to Knoxville. Oh and TOOTS! Schlitz FTW. Yum! I just ate there! The reuben is awesome! Its creamy 1000 dressing goes so well with the savory dark bread. And I have to say that I loved the French Onion soup. I was a vegetarian for 10 years, and soups were always a big struggle. No one makes vegetarian soups, so I was thrilled to have an actual vegetarian French Onion soup. It was hot and oniony and I didn't think it was too, too sweet. YUM! I am excited to go back and try their wine list. Roberto, I ate at Calypso Cafe a few months ago and it was good but I've never been served by creepier people. Do you know what I'm talking about or is that out of the ordinary? Ben, I love that area. I went to Friends after we ate and bought a kitty cat teapot. Em, I'm really glad you liked the soup. Just not my thang. Wax S, Do you know much about the 8 shooters gallery? a friend of mine has something to do with 8 shooters gallery there. i'll ask him. B, I'm pretty sure it's a collective or cooperative style gallery and photography studio. I think it was started by 8 shutterbugs originally. They're usually open on First Fridays. I'm close to some folks who have shown their work there. Very very friendly group. But I didn't address your question. I guess the answer depends on what you mean by "much." I ate there yesterday and yes, the Reuben is fantastic. I agree with Em on the french onion soup. Being a vegetarian, I don't get the chance to have it very often since most restaurants choose a beef broth base. Personally, I liked it. The same thought goes with the potato salad. I don't eat eggs or mayo, so having an option with neither of those things was a nice surprise. The potato salad had just the right amount of dill wasn't too saucy. My husband had the tofu veggie skewers. There were quite tasty as well. The veggies were not overdone and this place knows how to make tofu. Lemon polenta added a nice side to the dish. Does anyone know the hours of this place off the top of their heads by chance? 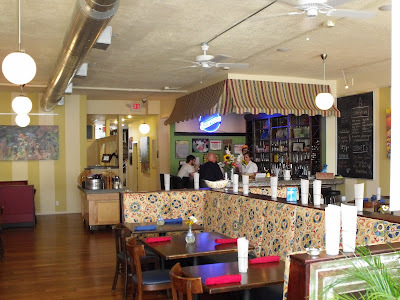 Its always hard trying to eat out as a vegetarian, but hopefully this place will become a quick favorite. When I went, I was told that the website was going up that day, but I haven't seen it yet. As far as I remember, the hours are 11 to 9 on weekdays, 11 to 11 on Friday and Saturday and closed Sunday. But I could be misremembering so I would go for the first time during a safe hour and find out from there. anybody know what else is on the menu? I'm a former vegetarian on a strict diet- no soy, no starch, no sugar, etc. Just wondering if they have stuff without tofu/soy? B, we should ride our bikes over there one night.